Nilaya's owner and crew collect the Loro Piana Prize: Boat International Media Trophy for the top scoring yacht of the regatta. The 2016 Loro Piana Caribbean Superyacht Regatta & Rendezvous drew to a close with a final day of dramatic racing that saw Nilaya win Class A despite her spinnaker blowing out at the end of the first downwind leg. The 34.13m sailing superyacht also won the Loro Piana Prize: Boat International Media Trophy for the top scoring yacht (100 foot LOA or greater with full cruising interior) of the regatta. Despite mixed racing in Class B that saw a different yacht win each race, the overall winner was P2 – partly thanks to her win on Race Day Three but also because her closest rival Hetairos finished in fifth place on the final day. Class C was dominated by overall winner Seahawk, who won two of the three race days and was only beaten on the last day by Bella Ragazza crossing the finish line just five seconds ahead. Seahawk also won the YCCS Plaque awarded to the top scoring YCCS member and Bella Ragazza won the Britsh Virgin Islands Trophy. Freya was the undisputed winner of Class D, taking first place on all three race days. 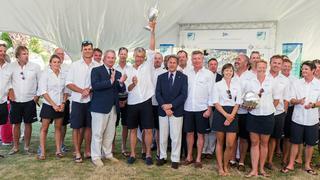 Clan VIII was named winner of the Spirit of the Regatta Trophy at the prize-giving ceremony.